Facebook has tried algorithms and surveys to help create the perfect News Feed, and now the social network is apparently turning to actual people. Steven Levy of Backchannel reported that Facebook is paying some 600 users to interact with their News Feeds four hours per day on a modified version of the social network, in an effort to make better decisions on what its users want and don’t want to see in their News Feeds. Levy reported that an office park in Knoxville, Tenn., is one of the locations where this project is ongoing, adding that 30 people there work out of an office with a Facebook-inspired open floor plan, and even some of the motivational posters that are found at its headquarters in Menlo Park, Calif. According to Levy, the 600 or so participants click a button on a special version of Facebook, and they are served the 30 top News Feed stories, personalized for each user, as determined under the social network’s current formula. The posts are generated in random order. The participants go through each story, Levy reported, interacting as they would if they were using Facebook on their own: ignoring posts, commenting, liking, sharing, clicking through links. They then answer eight questions, including how they felt about the story, how much they care about the user who posted the story, whether they felt that the story was appropriate for their News Feed, how entertaining they found the story, and whether it helped connect them to friends and family. Finally, participants are tasked with writing one paragraph on each story, explaining their overall feelings about that story. It’s a pretty intense process. The stories we do best on are tagged and photo stories. Our rankings get better and better the more a story is about a person and the less it’s about an article. It’s as expected: In general, commercial content is less desirable than other forms of content. The dream is to get to this world where people feel that Facebook is an instrumental, useful, important part of their lives. That’s the golden thing. At the beginning, we simply used our own intuitions and our own experiences. That’s all we had. We really try to not express any editorial judgment. We might think that Ferguson is more important than the ALS Ice Bucket Challenge, but we don’t think we should be forcing people to eat their vegetables even though we may or may not think vegetables are healthy. We can ask people what topics they’re interested in, and promote things about sports if you like sports, demote news if you don’t like news. Some of those insights will be useful in evaluating very specific ranking changes, and some will be useful in terms of product changes. One is connecting you to your friends and family — that’s the fundamental value that Facebook is based on. The second is to inform about things that you might be interested in, whether it’s news or sports scores or how to wash your jeans. And the third thing is to entertain you, whether it’s making you laugh or showing you videos or trailers. If you ask people about each story individually, they’re going to naturally rate emotional reactions really highly, which is what we’re seeing. Whereas once we start to ask about sets of stories, our hypothesis is that people will start to ask for more friend content and more informative content. 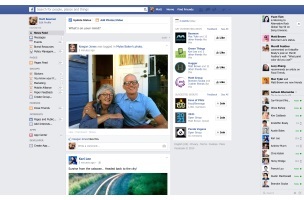 Readers: What changes would you like to see in Facebook’s News Feed?